The time tracking view within a specific project provides an overview over all time tracking entries of the project. Whereas the time tracking overview over all projects displays all time tracking entries of all projects. Both views can be individually customized regarding your personal needs. 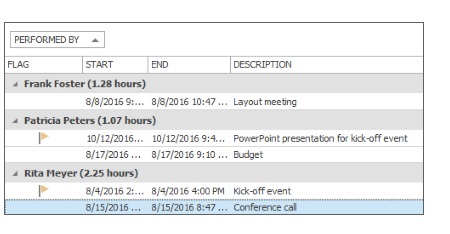 In the time tracking views you can add various additional information by adding more column headings. 1. 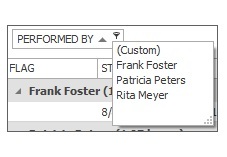 To add new column headings, right-click and choose Select fields in the context menu. 2. A new dialog box that displays all available fields will open. If you want to add one of the fields to your list, drag it to your preferred location in the list. Two arrows indicate the position of the new column. 3. To delete a column heading from the list, drag the field back into the dialog box or into the empty area below the list. 1. To group time tracking entries by a specific column, drag a column header into the field directly above the column headers. 2. By clicking on the arrow next to the group criteria, you can change the order from ascending to descending or the other way round. 3. 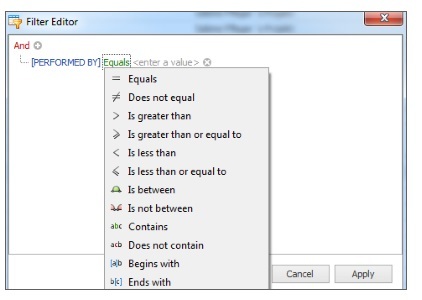 Here you can use an additional filter option: Move the cursor over the group criteria. A filter icon appears in the right corner. Click on that icon to further limit the criteria. Additionally, you can sort time tracking entries by column headings. Click on the column heading and then click again to change the sorting order. Customize time tracking views • Copyright 1999-2019 © InLoox, Inc. All rights reserved.